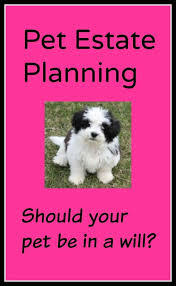 Have You Included Your Pet in Your Estate Plan? Some of our trust and estate clients have asked us how to best protect their beloved pet in the event of their disability or demise. Pets can be just as important as children when planning one’s estate. These family members can be adequately provided for in a legal fashion. Traditionally, pets have been considered to be personal property, being no different than a car, furniture and the like. Our post addresses how personal property is typically distributed after someone dies. Some pet owners consult us to have their pets treated in a more personal fashion in their legal documents. Practical matters should be considered such as selecting a potential caretaker and confirming with such person that they are willing to serve. The caretaker should be informed about the pet’s habits and preferences, such as how often and where the dog likes to be walked and pet food preferred. Contact information for the veterinarian, medical conditions and medications taken should be indicated. Funeral arrangements should also be made known, such as whether a cemetery plot has been purchased and whether funeral expenses have been prepaid. These practical matters are particularly important because the pet is unable to communicate, as a child may. From a legal perspective, persons interested in legally protecting their pets should consult the attorney who is drafting their overall estate plan. Financial consideration to the caretaker needs to be arranged, while at the same time requiring the caretaker to perform certain duties on behalf of the pet in order to be compensated. A pet trust is a legally appropriate means to accomplish this goal. Such a document (or provision within a Will) would provide that a certain sum of money is to be set aside for the care of the pet by a particular person, which sum is to be released in particular intervals provided that the caretaker is assuming the duties expected or upon delivery of proof of payment of expenses on behalf of the pet. The pet owner may also consider making a bequest in her Will to set aside a certain sum of money to compensate the caretaker, provided that the caretaker assumes responsibility for the pet. This option is only appropriate if the pet owner is confident that the caretaker will be available and will definitely carry out all duties needed. Whether a trust is established or a bequest is contained in the Will, the pet owner should calculate the monies typically needed to care for the pet, such as veterinary care, food, grooming expenses and the like. Legal matters may also arise when a couple enjoys a pet together and then divorce or one of the individuals predeceases the other. Which individual should keep the pet? Recently, the Nassau County Surrogate’s Court ruled that the best interest of a dog is not the appropriate standard to determine where a dog should be placed after the death of its owner. The Judge in this case ruled that a dog is to be considered personal property and will reside with the party to whom it was left in a Will or according to the laws of intestacy. In the absence of a written agreement, potentially the name on the pet’s license would dictate the owner and future custodian of the pet. If this is not acceptable, estate documents may need to be drafted to specify preference. When consulting with an attorney concerning estate matters, it is important to discuss all matters of concern, such as pets, so that adequate provisions are made in one’s estate plan. Our attorneys are available to discuss your estate planning questions.